Well folks, we are about 2 months away from the theatrical release of Iron Man 2. So you know what that means… THE TOYS ARE OUT! THE TOYS ARE OUT! One caveat (if you haven’t heard) is that these are all 3 3/4 scale now. Just like the X-Men Origins: Wolverine line of last year, there is both a comic series and a movie series. Reports are that the first wave of both the comic and movie series are being found at Wal-Marts across the nation. But today we have a preview of some future wave! Here are what looks to be Unmasked War Machine (Jim Rhodes), Black Widow, Unmasked Iron Man (Tony Stark), Whiplash, and Nick Fury. 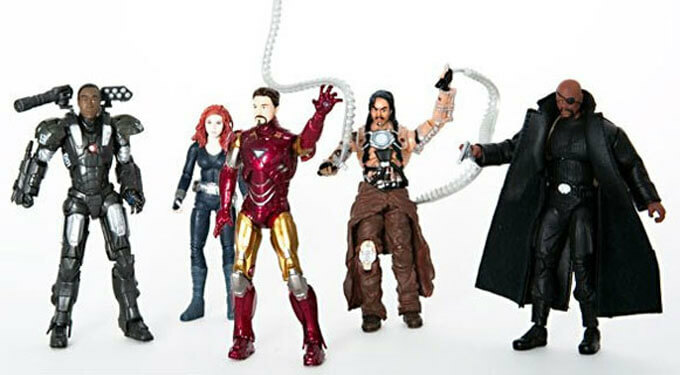 For me personally, Nick Fury is a must have, and he will probably go in with the G.I. Joes. I hope they make a Tony Stark in a business suit sometime as well. So of these figures, I have seen Whiplash in a Target multi-pack as well as a single-packed figure. Nick Fury I have seen in a Toys R Us Multi-pack. I have heard that unmasked War Machine and Black Widow are in upcoming Target exclusive multi-packs, but I don’t have any more info on that. No word on where the unmasked Iron Man is supposed to be. Feel free to share your knowledge in the comments below! Lazy Sunday Post: Dr. Horrible’s sing along blog. Meh. I’m not racist or nuthin’ but I prefer old-school Fury. Actually in Wolverine & The X-Men he’s black. With hair that’s graying at the temples! They should make a red Nick Fury next. i must say you have great blog, i will come back again and read your blog for sure. Hey! That Spambot’s a nice guy! I wish more Spambots were like that! Also, in the new Avengers cartoon on Disney XD, Nick Fury is Black but has been artificially “aged” by some supervillian in an episode, giving him the grey at the temples as well.